As first announced at the SVG Summit this week, AT&T DirecTV will become the first U.S. pay-TV provider to offer a live 4K HDR telecast with tonight’s production of the Pittsburgh Penguins vs. Vegas Golden Knights game. The NHL matchup will be simulcast on NHL Network. In addition to the Penguins–Golden Knights game, AT&T DirecTV will also broadcast 13 NBA games in 4K HDR this season. Mobile TV Group’s 39Flex truck is being used for DirecTV’s 4K HDR production in Las Vegas tonight. 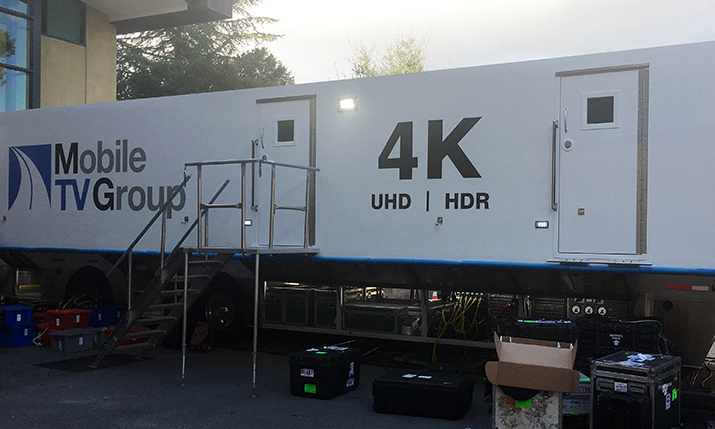 For tonight’s 4K HDR production in Las Vegas, DirecTV will deploy Mobile TV Group’s 39 LEX mobile unit, which will produce the game natively in 4K HDR and serve as the home-feed truck. The HD feed for NHL Network will be derived from the 4K HDR show. Last season, AT&T and NBA TV (which is jointly managed by the NBA and Turner Sports) provided fans in the U.S. with the opportunity to watch an NBA game in live 4K Ultra HD (UHD) for the first time when DirecTV distributed NBA TV’s telecast of the Denver Nuggets–Utah Jazz game on Dec. 3, 2016. The NBA was the first U.S. professional sports league to capture a game in 4K in January 2015, when the New York Knicks played the Milwaukee Bucks during NBA Global Games London. The Brian Setzer Orchestra’s 14th annual “Christmas Rocks!” concert live from the Granada Theatre in Santa Barbara, CA, on Monday Dec. 18 at 8 p.m. PT simulcast on AXS TV. HDR adds better contrast, and wide color gamut (WCG) makes the colors on your TV more closely match what you see in real life. The 10-bit color depth shows a smoother gradation in color. For example, the gradients of a sunset will appear smooth rather than banded. And, at 60 frames a second, motion will be more fluid. AT&T offered the first-ever live 4K UHD broadcast in the U.S. with the 2016 Masters tournament and, continuing to lead in live coverage of events and sports, has aired more than 700 hours of programming from college football, NBA, MLB, the Olympics, and more. DirecTV hosts three fully dedicated 4K TV channels (104, 106, and PPV channel 105) with both live and previously recorded documentaries, concerts, series, and pay-per-view events.